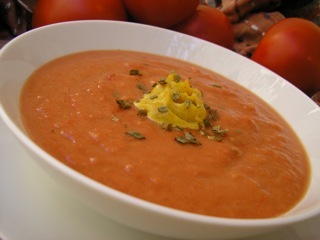 This easy gazpacho recipe tastes even better using canned tomatoes than fresh. Really. Plus there is a health benefit in using cooked tomatoes which have an even higher level of antioxidants than fresh. 1. Place all soup ingredients in the work bowl of a food processor. Process until well blended but not pureed. Remove to a 2 quart plastic container. Stir in up to 1 cup water until desired consistency is reached. Refrigerate several hours or overnight, if possible. 2. In a small bowl, stir together ingredients for Curry Cream sauce. Set aside until ready to serve. 3. Serve cold, topped with a small dollop of Curry Cream and chopped green onions, cilantro or parsley, if desired. QITK tip: If you enjoy The Kosher Channel, you'll want to receive the newsletter I send every month or so. "You are The Queen in The Kitchen" gives an entertaining and thoughtful insight into the season with links to The Kosher Channel's latest recipe postings.